Located among the rolling hills of Waterloo Recreation Area, between Jackson and Ann Arbor, is the Gerald E. Eddy Discovery Center. Originally a nature center that was closed due to state budget constraints, the facility was reopened in 1989 as a tribute to Gerald Eddy and reflects his career in geology and his dedication to preserving Michigan’s natural areas. With touch-screen computer games and interactive displays geared for children, the center is a wonderful destination for families, who can then top off the afternoon with a hike along one of the center’s six trails; Old Field (O.8-mile), Lowland (1.1 miles), Spring Pond 1 mile), Bog Trail (1.5 miles), Oak Woods (1.3 miles)and Lakeview (1.5 miles). With the exception of Lakeview, all the trails begin near the Discovery Center. 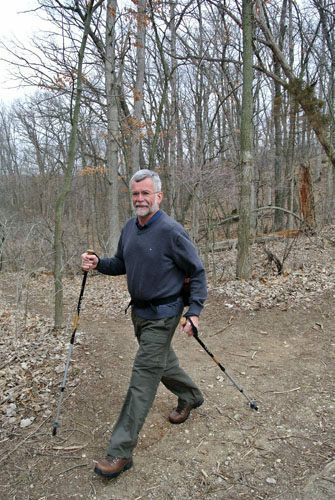 This outing is a combination of the Oak Woods and Lakeview Trails, a 3.6-mile walk that includes several viewing points of Mill Lake and backtracking a short segment of the Waterloo-Pinckney Trail. 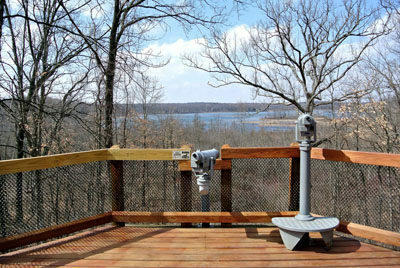 Pick up the Oak Woods Trail near the interpretive center where it is marked by post No. 5 in upper parking lot. Heading west the trail follows a ridge, a glacial moraine left over from the last ice age. Within a quarter mile the oak-hickory forest opens up to views of ponds and lakes where a bench has been located. 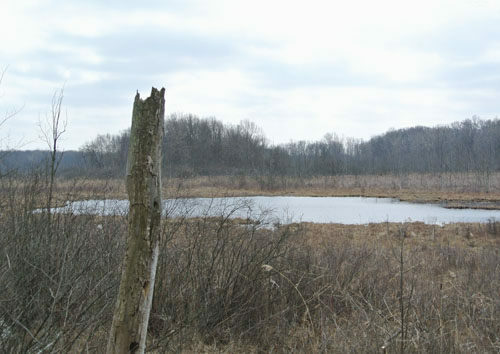 From the bench are views of one of the largest concentrations of bogs in southern Michigan. Oak Woods Trail continues in a westerly direction and at Mile 0.4 from the Discovery Center arrives at post No. 8, marking its junction with the Waterloo-Pinckney Trail. The long-distance route stretches 35 miles from Portage Lake in Waterloo Recreation Area to Silver Lake in Pinckney Recreation Area. Head west (left) and follow it to reach Lakeview Trail. You immediately use a foot bridge to cross a stream and then the trail becomes a level and pleasant walk through a deciduous forest to post No. 9. Head west (left) at this junction and you’ll pass a private cabin on Spring Lake and then arrive at post No. 10 at Mile 1.1. Here the two trails split, the Waterloo-Pinckney Trail in a westerly direction (left) and the Lakeview Trail north (right) where it swings near McClure Road and then passes open fields and scrub that use to be the site of a golf course in the 1920s. In late spring these open areas are covered in wildflowers. At Mile 1.8 you arrive at post No. 11, where a spur heads north (left) to the Lakeview trailhead on McClure Road. The main loop heads south (right) and continues along the ridge passing more views of Mill Lake until it returns to post No. 9 at Mile 2.2. You retrace your steps to post No. 8 but this time head north (left) at the junction and immediately climb another ridge. At Mile 3 is a bench overlooking Mill Lake, a scenic spot to take a snack break. 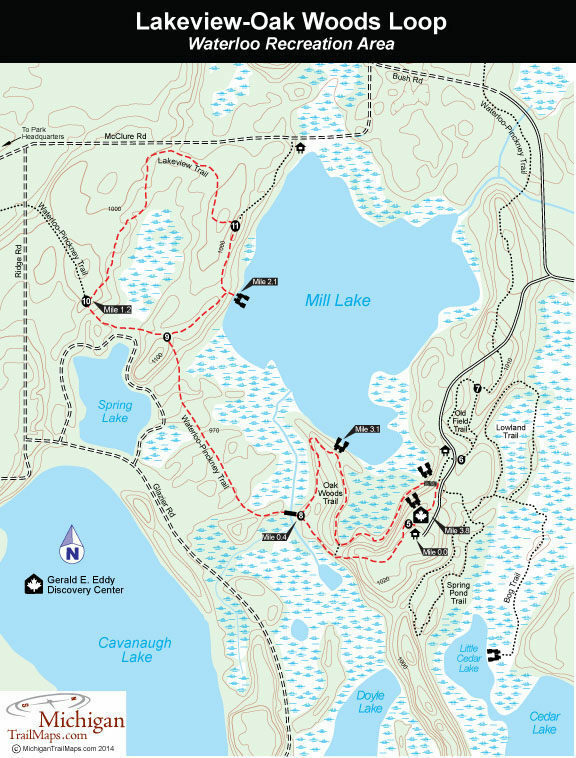 Oak Woods Trail descends and swings away from the lake, passes a short crossover spur and at Mile 3.6 arrives at a long stairway featuring a bench in the middle of it for one last view of Mill Lake. At the top is the paved path from the lower parking lot. Head right on it and you’ll be back at the Discovery Center in minutes. At The Gerald E. Eddy Discovery Center there are parking lots, drinking water, restrooms and viewing decks with spotting scopes along with the interpretive displays. From Memorial Day to Labor Day the Gerald E. Eddy Discovery Center (734-475-3170) is open Monday through Saturday 10 a.m. to 5 p.m. and Sunday noon to 5 p.m. The rest of the year it is closed on Monday. A vehicle permit or annual state pass is required to enter the recreation area and can be purchased at the Discovery Center. The Gerald E. Eddy Discovery Center is reached from I-94 by departing north onto Pierce Road (exit 157). Brown park signs lead you north along Pierce Road, then west (left) on Bush Road to the entrance of the parking area. For more information contact the Gerald E. Eddy Discovery Center (734-475-3170) or the Waterloo Recreation Area headquarters (734-475-8307).